How to build predictive models that win competitions. The predictive models that we produced won head-to-head competitions and were chosen by clients. For example, our model predicting the risk of a new customer will not pay his/her phone bill was used by a top 3 cell phone company. Our debit card fraud detection model is being used by a top 15 banks. Our competitors included one of the three credit bureaus that had hundreds of statisticians working for them. We have found that if we follow a number of principles, we will be able to produce good predictive models and quality data analytics work in general. The first principle is to avoid making mistakes. We have seen many cases where mistakes damage the reputation and credibility of data analysts. For example, statisticians analyzed data and drew the conclusion that compromised credit cards were less likely show fraudulent activities than normal cards. It was a mistake, of course. One of our competitors loaded customer's data wrongly and produced reports where the numbers did not make sense at all. Mistakes like those will cause immediate rejection from clients and permanent damage to analysts' reputation. We need to realize that avoiding mistakes should be an inherent part of our processes. In a large project, from data gathering, loading, validating, summarizing, model building, report generation and model deployment, we may have to take many steps and produce hundreds of data sets. To avoid making mistake, we need to double check our results. We have found that it is actually much harder to verify the results are correct than to simply execute the steps to produce them. Oracle Ntile function divides the records into the same number of rows (off at most by 1). Please notice that the records with same variable values (ties) may be placed into different buckets. The following query result shows that the maximum value in a bucket may overlap with the minimum value in the next bucket. We can also use function cume_dist combined with ceil function to divide the records into similar number of rows. Ties will be placed into the same buckets. The following query result shows that there is no overlap of values between different buckets. To determine the points manually is subjective. A much better way is to build a logistic regression model and use the model coefficients as the "points". A scorecard created this way is accurate and yet still provides the transparency of a scorecard. One of the top cell phone service provider actually used our model-derived scorecard to screen the new customers. We may want to perform some transformation of the coefficients so that the score will be within the desired range. In Oracle we can use least function to find the smallest one among many values. The number of input variables are flexible. Similarly, to find the largest one among many values, we use greatest function. The following are examples. The following example shows that least/greatest functions take multiple columns as inputs and return the result for each row. Min/max functions take only one column as parameter and return the result for the all the rows. Some algorithms may appear prohibitively expensive to perform computationally. One of such examples is finding for each data point in table A the nearest K neighboring data points in table B (shown in the figure below). From the surface, it involves calculating the distances between 2 trillion pairs of data points (1 million times 2 million). However, with database tricks such as binary-tree index, we can make the above algorithm very efficient. Thus, it is helpful for algorithm guys like mathematicians to understand some database technologies. With those database tricks, we can implement algorithms that may be hard to do otherwise. Merging data from difference sources is probably one of the most challenging data preparation work. For example, debit card authorizations are captured in real time at the point of sales. However, the actual settlement of the transactions may take a few days. The settlement date, amount and merchant name could all be different from those in the authorization data. It is very challenging to match transactions in these two tables. The following two tables illustrate this issue. To match authorizations and their settlements, simple table joining will obviously not work because there are not exact keys to link them. Probably, the only way to do this is to use a fuzzy, iterative matching approach. We can measure three distances between an authorization and settlement, i.e., merchant name distance, transaction amount difference and transaction date difference. 1. Merchant name distance can be measured using the following function. For exact string matches, utl_match.EDIT_DISTANCE_SIMILARITY returns 100. For no matches, it returns zero. 2. Transaction amount difference is abs(a.amt-b.amt) . Once we calculate the above three distances for each pair of records in authorization and settlement data sets, we can assign a weight to each of them and combine them into a single distance that measures the similarity between two records, i.e., record_distance= w1*merchant_name_distance + w2*amount_distance +w3*date_distance. We can identify those pairs having the least distances for each card.Those pairs are considered successful matches and are removed from the data. We repeat this matching process for the remaining data until we are happy with the results. This process can be fully automated. I have used the approach to merge about 50 millions authorizations from 3 millions debit cards. It only took about an hour. To calculate monetary variable, we can use analytic function sum (amount) over(). Thus, we can combine the quintiles for recency, frequency and monetary to create a RFM code for each customer. This can be done using the following query. RFM code 555 is the best group of customers. The result may look like the following. Just like we do for recency variable, we can divide customers into 5 or 10 equal size buckets, called quintiles or deciles, based on how frequently they respond. The following query calculates quintiles and deciles for each customer based on how frequently they responded to our offerings. The more frequently the responses, the higher the number for quintiles or deciles. The output of the query looks like the following. Frequency measures how many transactions happen within certain period of time. Usually, the more frequently a customer responds to the direct mailing offerings in the past, the more likely she will make additional purchases. In the case of credit card fraud, the fraudsters tend to make more frequent purchases than normal consumers do. Frequency variable can be calculated using SQL analytic function such as count() over(). Again we use the following credit card transactions as examples. The following query calculate the number of transactions in the past 6 (0.25 day) and12 hours (0.5 day) before the current transaction. Assume we have historical data about customer's responses to our direct mail offers as shown below. Today we want to send them new letters. We believe that customers who responded to our offerings recently are more likely to respond to our future offers. We can divide customers into 5 or 10 equal size buckets, called quintiles or deciles, based on how recently they responded. This practice is common. The following query calculates quintiles and deciles for each customer based on how recently they responded to our offerings. The more recent the response, the higher the number for quintiles or deciles. The output of the query looks like the following. Customers with higher quintile or decile numbers are more likely to respond to our offerings. Of course, the most accurate way to predict a customer's response is to build a predictive model that uses the recency as one of its input variables. RFM (Recency, Frequency, Monetary) analysis captures the context information about an account or customer. The result of RFM analysis is a set of variables that can be used for ad hoc queries, segmentation, or predictive modeling to identify valuable customers, detect fraud, improve direct mailing response rates, etc. RFM analysis is usually performed based on a "transaction" data set. Each record represents a transaction at specific point in time. For example, the following are a sequence of credit card transactions. We talk about recency factor first. In the following table, transaction 4 as the highlighted is most suspicious. Not only it is an expensive electronics purchase but also the immediate transaction before it is a $1 gas station purchase that happens 11 minutes ago. Fraudsters often use gas station to test a credit cards to make sure they work before they make big purchase at a store. Thus, the recency is an important consideration. It provides the context information about a transaction. When we build predictive models or write ad hoc fraud detection rules, including recency factors can greatly improve detection accuracy. Another example is to predict if a prospect responds to a direct mail offering. The following table shows a prospect's responses in 5 weeks to 5 products. The reason that she responds to offering of product C in week 3 could be related to the offering of B one week before. For example, a person will more likely accept a credit card with 6.99% APR if the she is offered 17.99% APR earlier. Again, the recency factors are important. One of the convenient ways to calculate recency factors is SQL analytic function lag. For example, the following query calculates three recency factors for credit transactions, i.e., time since recent transaction, recent transaction type and recent transaction amount. The "Partition by card_number" clause means the calculation is done independently for each card number. When there are time/date variables in the data, it is extremely important to take advantage of them by using RFM analysis to create derived variables. Those variables can then be used as inputs to predictive models. Please see another post Build Best Direct Marketing Predictive Models. Many organizations have analysts who create business rules to identify most profitable customers, detect credit card or medical claim frauds, etc. Analysts in a company may maintain hundreds or even thousands of rules and add new ones regularly. Those rules are usually derived from human intuition and experience. The following are two imaginary credit card fraud detection rules. (They are for illustration purpose only, not actual rules used by any banks). 1. 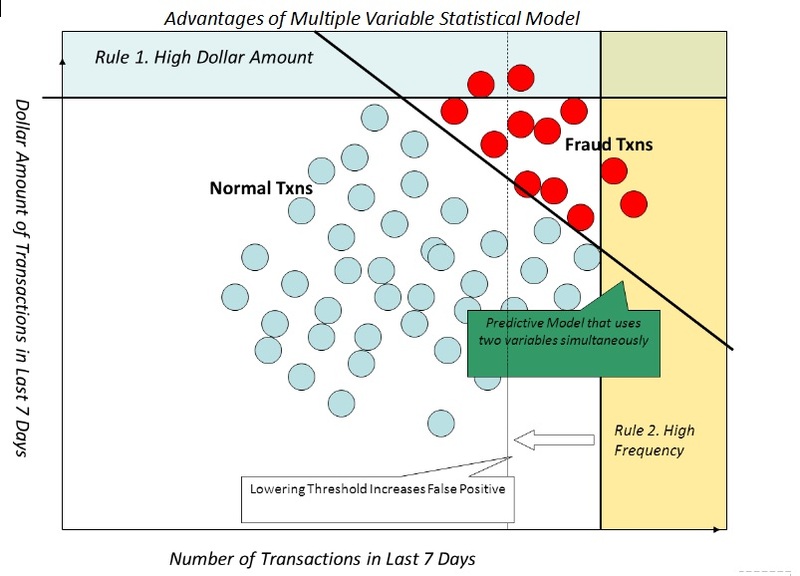 High frequency rule: If the number of transactions from a card in the past 7 days is above 75, then current transaction is fraud. 2. High dollar amount: If the amount of transactions from a card in the past 7 days is above $95,000, then current transaction is fraud. We can plot credit card transactions on a plane as shown below. X-axis is the number of transactions in last 7 days. Y-axis is the total dollar amount of transactions in the last 7 days. Based on the two variables, every transaction is represented by a dot in the plane. In this plot, red dots represent fraud transactions and blue represent good. Fraud transactions normally have higher frequency and cumulative amount since fraudsters spend money more aggressively. Thus most of the red dots are located in the up right corner (high frequency and high cumulative amount). A high frequency rule detects 2 red dots (yellow rectangle) and a high dollar amount rule detection 2 red dots (blue rectangle). Totally, we detect 4 red dots. If we want to detect more red dots, we have to lower the thresholds for those rules which will lead to many normal transactions being mistakenly marked as fraud. The most effective way to separate red and blue dots is the straight line that runs northwest-southeast direction as shown in the figure. Unfortunately, the line can not be described by intuitive rules. What a statistical predictive model does is to find such a line through learning from the data. A statistical predictive model can not be described intuitively but it is far more accurate. It is often to see that a single predictive model outperforms hundreds or thousands of intuitive business rules combined. There is a newer post about the comparison of predictive models and intuitive rules from 13 aspects. We have found that when analyzing large amount of data such as financial transactions, medical claims, cell phone calls, and credit information, missing values are common. Simply ignoring data points with missing values is recommended in most cases. There are a number of ways to handle missing values for categorical and continuous variables. The following examples illustrate how to replace missing values in categorical variables. In Oracle, this can be done easily using function nvl(). The following is the SQL scripts to perform the replacement. Method 2. Replace missing value with the most frequent value. The following is the SQL scripts to perform the replacement. The following examples illustrate how to replace missing values in continuous variables. Method 3. Replace missing value with mean or median value. Method 4. We first convert continuous variable into categorical variable. This is also called binning. I will discuss binning in another post. We define missing as a special category. The following is the SQL scripts to perform the above logic. There are more sophisticated methods to impute missing values using multiple variable models. But they are rarely used in real world applications. 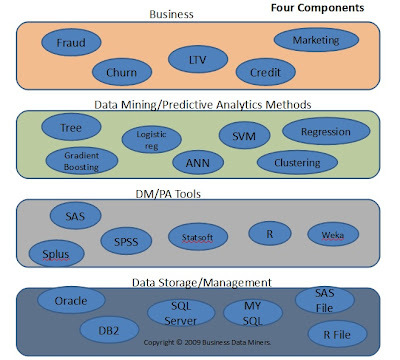 In previous post "Data Mining Components", we talk about four components or layers in a using data mining to solve business problems, e.g., fraud prevention, new customer life time value prediction, online ads click through rate, etc. 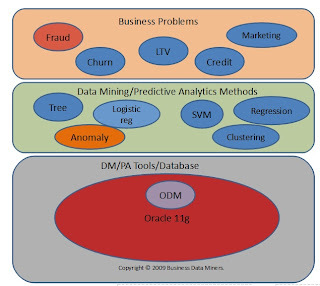 Two abstract components are business problems and data mining algorithms. By abstract, we mean their existence is largely mental. They do not have physical forms and can not be purchased. Two physical components are data mining software and data management tools. Data mining software are the implementation of data mining algorithms. Data management tools could be relational databases or plain files. It is important to realize that items within each layer are sometimes exchangeable. 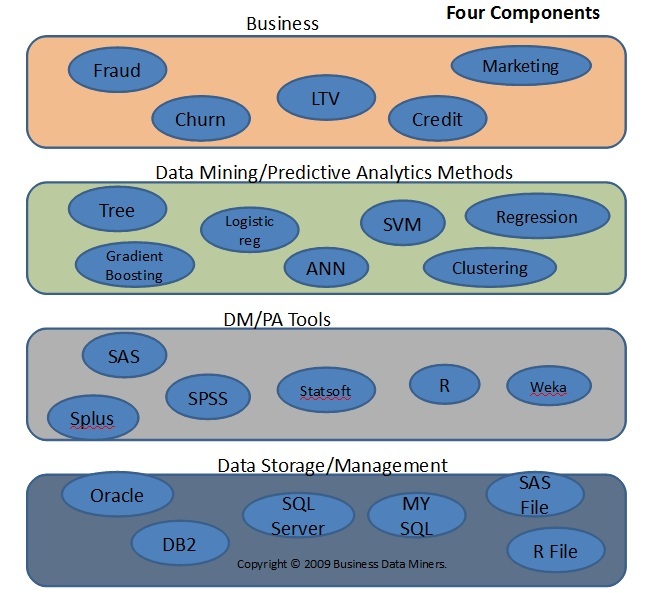 We can select the combination of data mining models, tools and databases that suit our needs. In these years, we have found that performing data mining within database has its unique advantages. In this in-database data mining scenario, two physical components, i.e., data mining algorithm implementation and data management, are collapsed into a single component, Oracle database. For example, we have used Oracle Data Mining to build debit card and check deposit fraud models. The in-database solution provides substantially increased security, productivity, manageability and scalability. This should not be a surprise because a database is designed to handle large data using SQL as a standard language in an enterprise environment. If we consider data mining as just more sophisticated SQL queries, nothing more, nothing less, a lot of difficulties in data mining practices will disappear naturally. Sample clause is also a great way to test the performance of a query before we run it on large tables. Oracle analytic function cume_dist() calculates the cumulative percentage for a variable. The following query selects the top 5% records based on variable num. The following query selects the bottom 5% records based on variable num. The following query selects the top 5% records based on variable num by group. There are many random generators that can be used for random sampling such as rand() in SAS, dbms_random.rand() in Oracle, rand() in Excel spreadsheet. I have helped implement a Winchmann- Hill random generator using PL/SQL. Here is a link to WH algorithm (http://www2.imperial.ac.uk/~hohs/S9/2007-2008/wichmannhill.pdf). The reason to implement Winchmann-Hill random generator using PL/SQL was that we wanted to replicate the sequence of random numbers precisely given the same random seed. We did not want to use SAS or Oracle random functions because we do not know how the details of their algorithms. We want to build WH random generators that work consistently across platforms, i.e., SAS and Oracle database. This is easier said than done. One of the lessons we learnt was that SAS integer can only have 17 digits while Oracle integer support 38 digits. We have to make sure that the random seed is not too large.